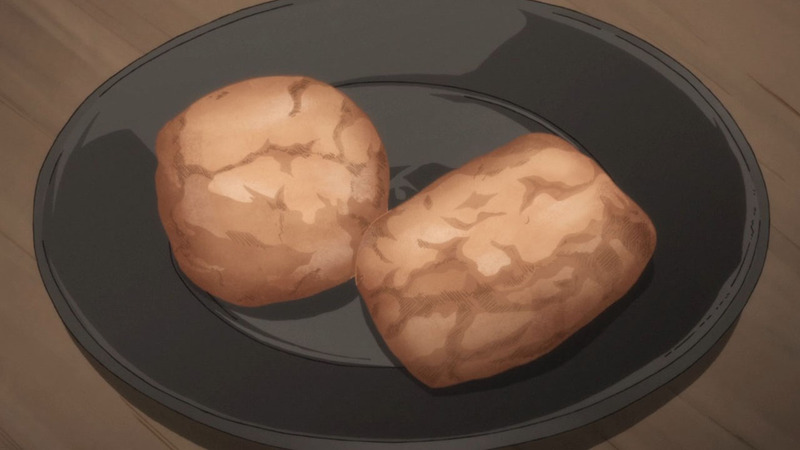 Smallpox was a dreadful disease. 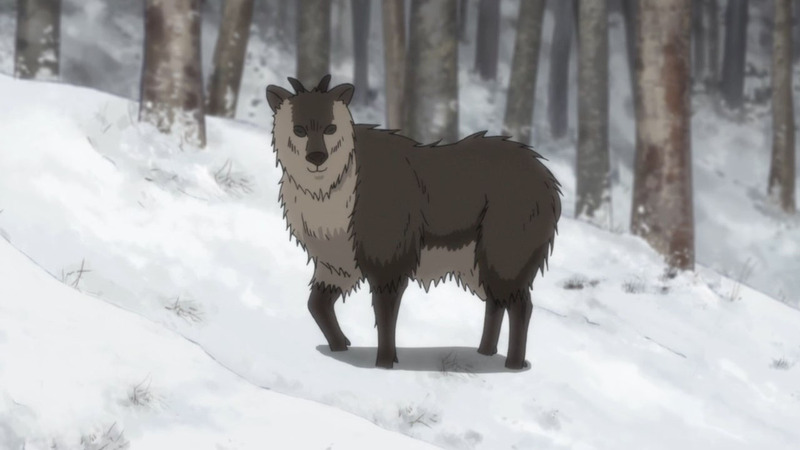 We get to see it here in this week’s episode of Golden Kamuy as rather nasty business but in real life it was much worse. 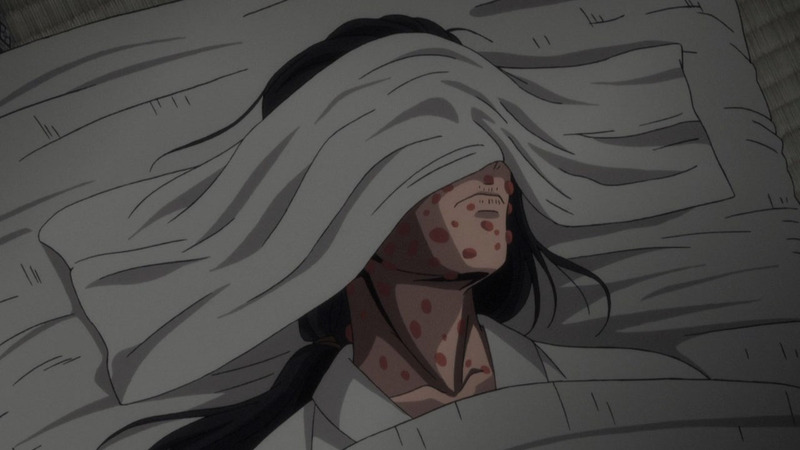 Those of you who have seen photos of the stricken know what I’m talking about (and if you haven’t, I would recommend you Google only if you have a strong stomach); while the lethality of smallpox was ‘only’ around 30%, it was the virus’s methods that made it horrific. Outwardly, pus-filled macules covered the entire body from the top of one’s head to the soles of one’s feet. But the real work—the stuff that kills you—was below the surface, where smallpox disrupted the the immune system, created an imbalanced state of clotting and bleeding, and the unfortunate would eventually haemorrhage to death. 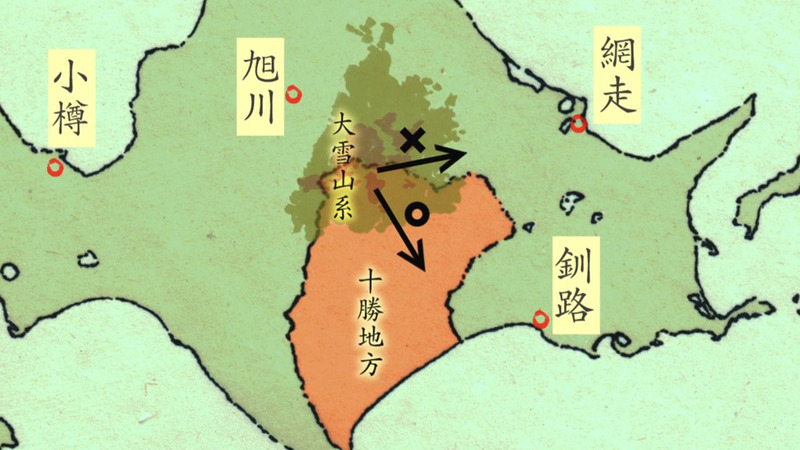 On top of all this, smallpox was also highly contagious and struck in large outbreaks that could decimate communities (Singular cases, like Tanigaki’s sister, were less common). It was also indiscriminate, slaying children and adults, peasants and kings, and in some dynasties back in the day whether a chosen heir had contracted smallpox when young—and gained immunity—was a real consideration. Perhaps it’s smallpox’s propensity to kill important people and not just be further sufferance by the poor that lead to such a dedicated effort to fight it. As you no doubt know, smallpox only exists today as samples in specific labs. We killed it. We killed it dead. This was thanks in no small part to Edward Jenner’s vaccine which replaced the rather riskier inoculation treatments and allowed for mass immunity to the dreaded smallpox. 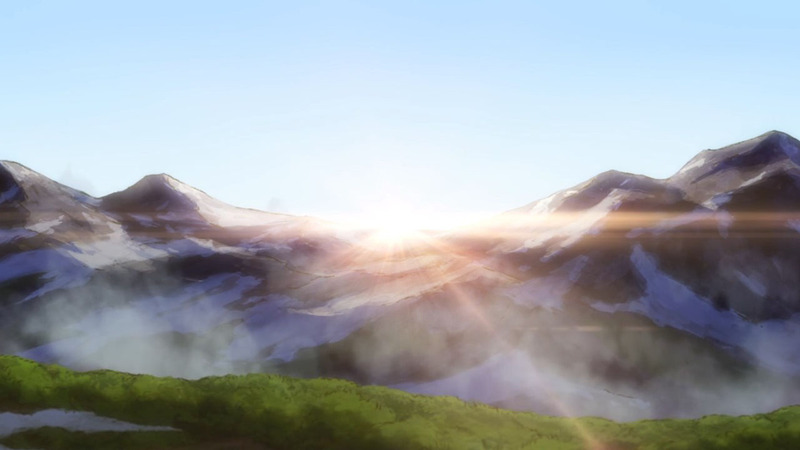 This was so even in far-flung Japan, deep in the Orient. When Japan’s isolationism ended the Dutch brought with them not just trade and missionaries but also vaccines, and perhaps it speaks to the fearsome reputation of smallpox that this strange, foreign medicine was embraced so widely across the country (after, of course, the initial societal push-back that all scientific advances face). By the mid 19th century the smallpox vaccine was mandatory for all children in Japan. 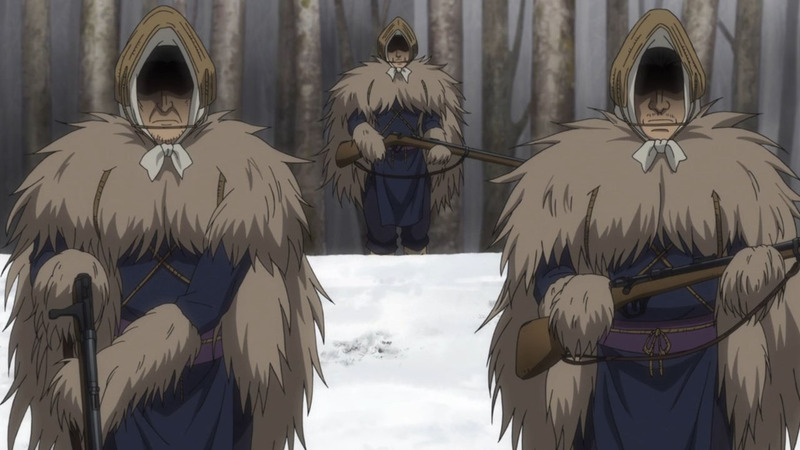 You may note that this was sometime before the events of Golden Kamuy, so how did Tanigaki’s sister contract smallpox? 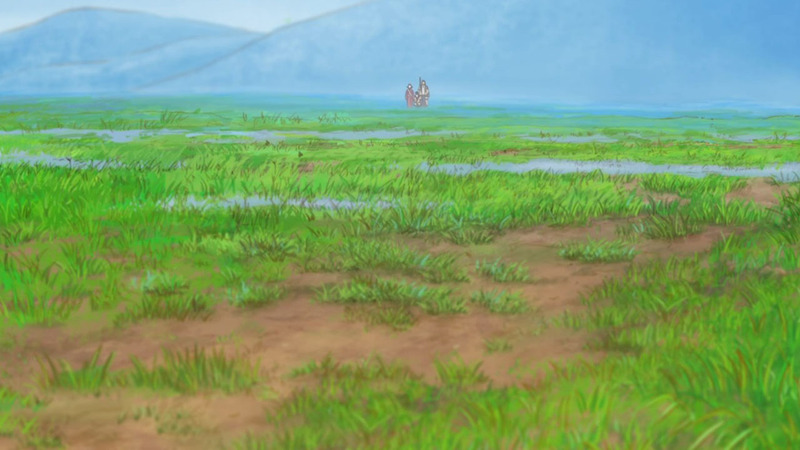 Perhaps her village was too remote. 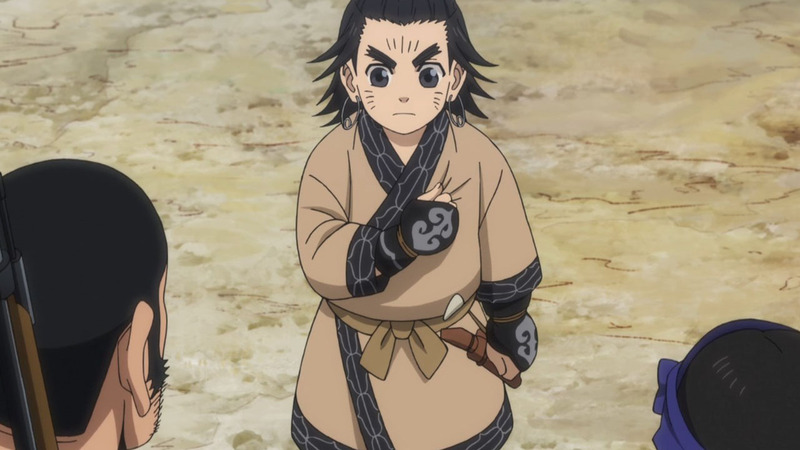 Perhaps the Matagi were anti-vaxxers. Details, details. 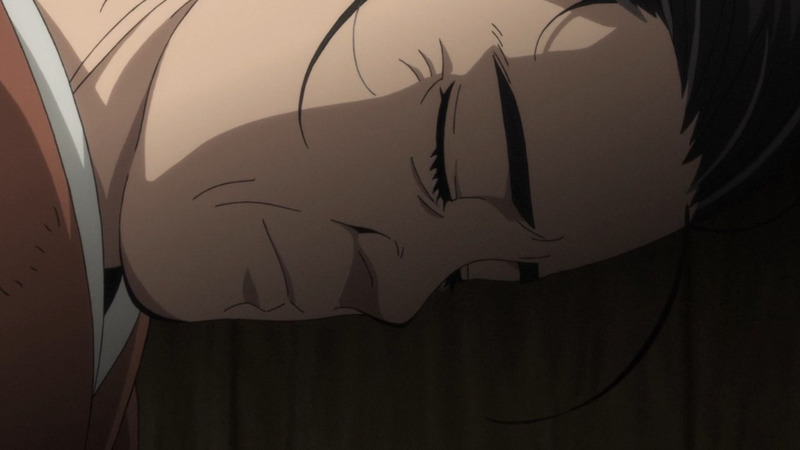 The point was, of course, not what exactly Tanigaki’s sister had and where whe got it, but that she was sick and had to be put down, and probably any kind of Key Heroine Syndrome would have sufficed. 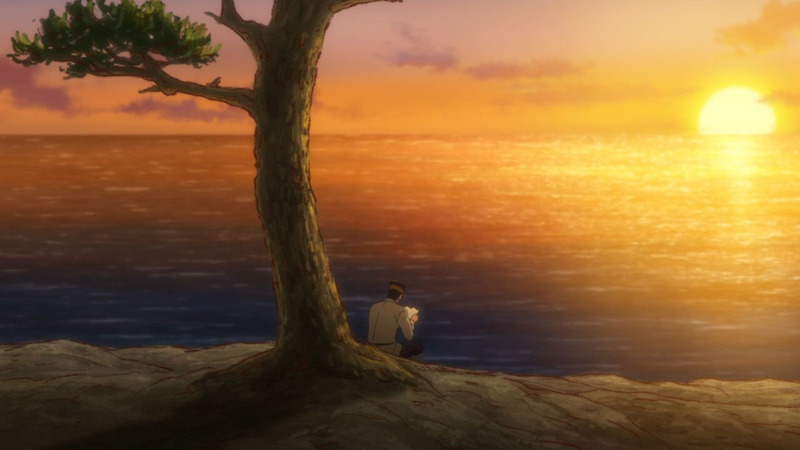 The point was to explore Tanigaki’s personal tragedy in a way that reminded me of an episode of Mushishi, in which mankind grapples with forces they cannot control and in the end there are no villains, only victims (the nature shots didn’t hurt). 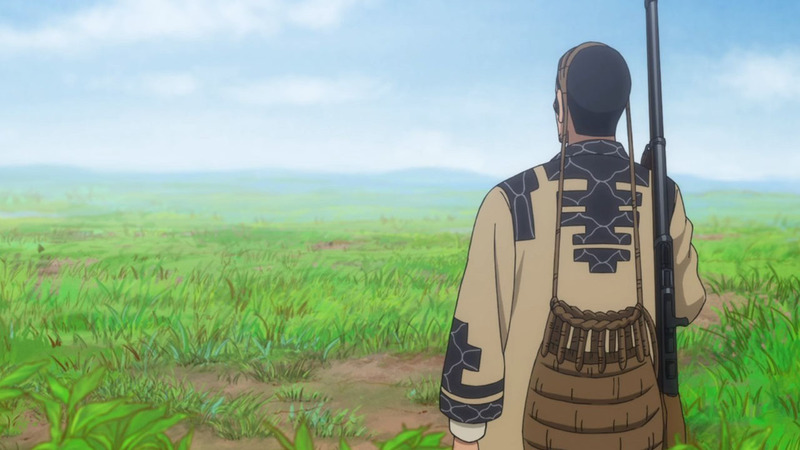 There’s not quite as much subtlety in the writing, though; it’s rather convenient how Tanigaki managed to find his friend right before he died and said friend managed to spit out his entire story in his final breaths. 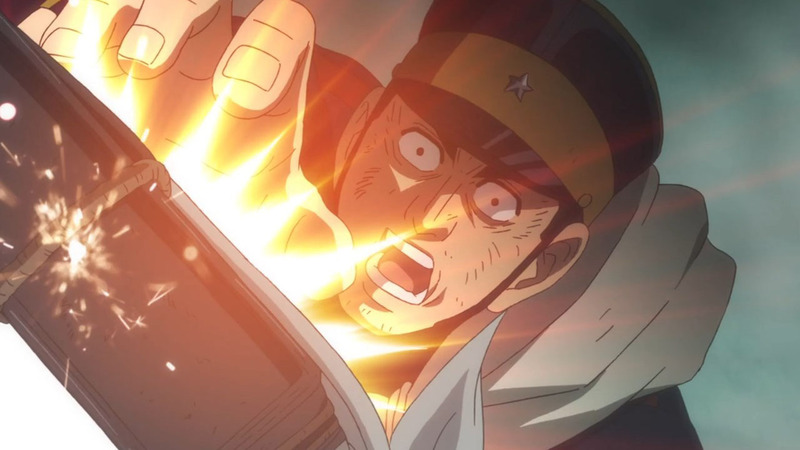 There’s something of a reliance on coincidences here, and perhaps Golden Kamuy knows that (and throws in a cheeky Sugimoto cameo for just that reason). There is a tragedy being spun here, and there are no lack of star-crossed tales in that genre. 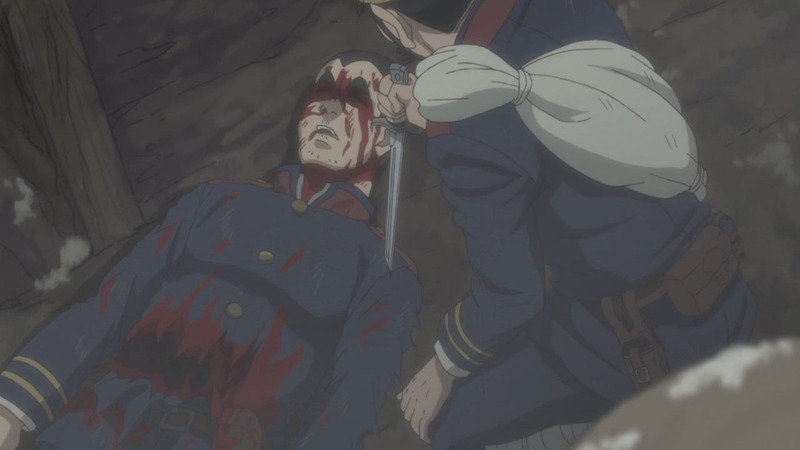 But it’s still altogether a bit out-of-character for Golden Kamuy; it hasn’t really indulged all that much in prolonged flashbacks for its characters, mostly reserving them for the tattooed prisoners as a means of exploring their particular brand of madness. 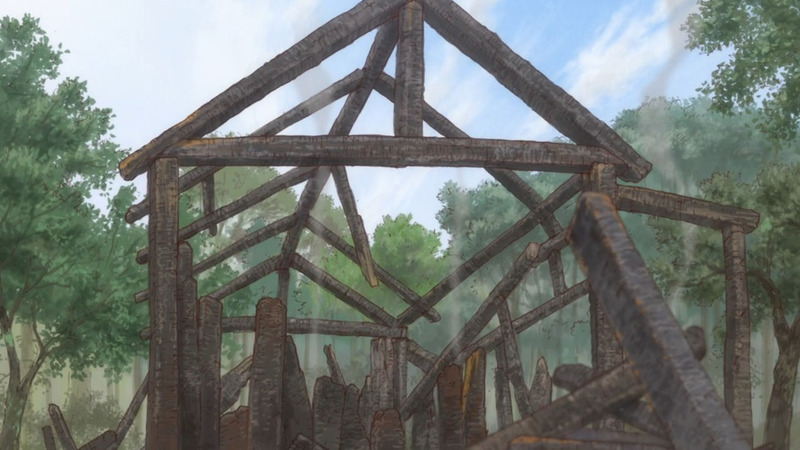 That is, they get their backstories and then they die. 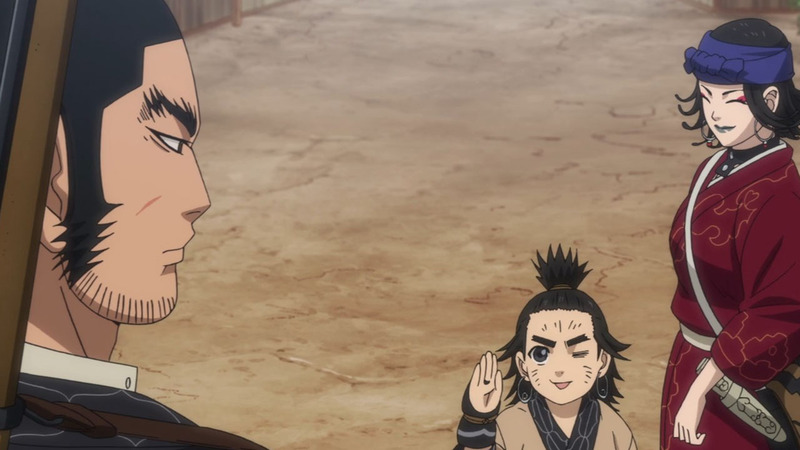 Sure, these days we’ve had more retrospection for the main cast (even Asirpa, who has been developed thus naturally so far, is getting dreams of her father), but part of me is still afraid that now we know what Tanigaki is about Golden Kamuy is going to kill him off. 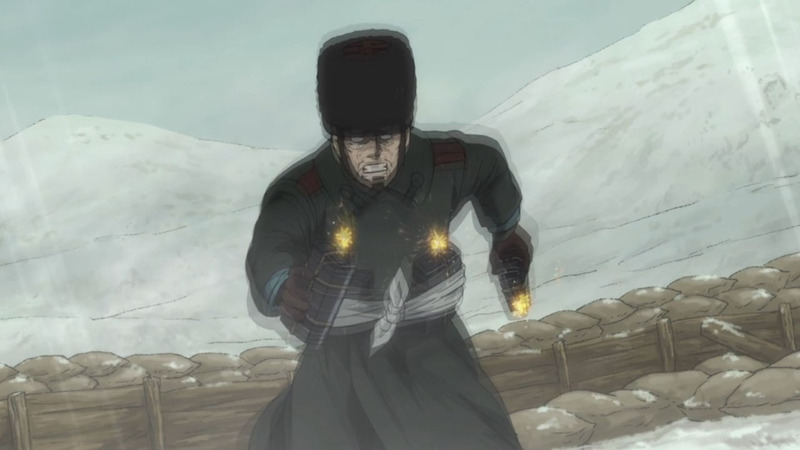 It wasn’t all just development for Tanigaki, though; through him, we also get more development for Lt Tsurumi. 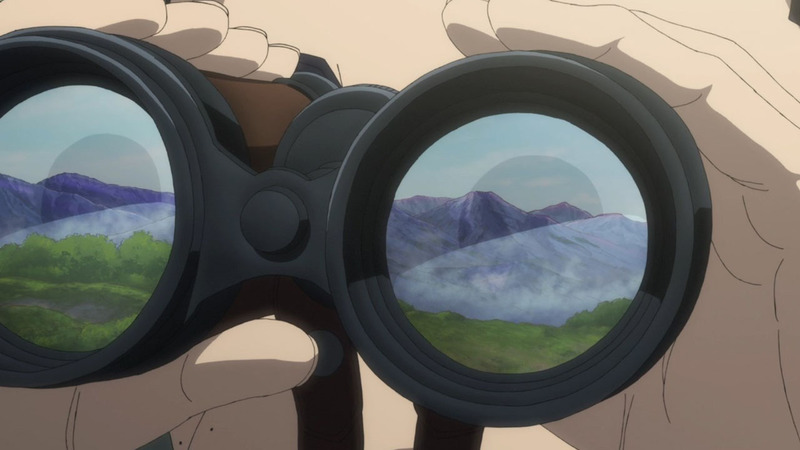 We all know he’s crazy, so the mystery has always been why his soldiers willingly, even fanatically, follow the crazy. 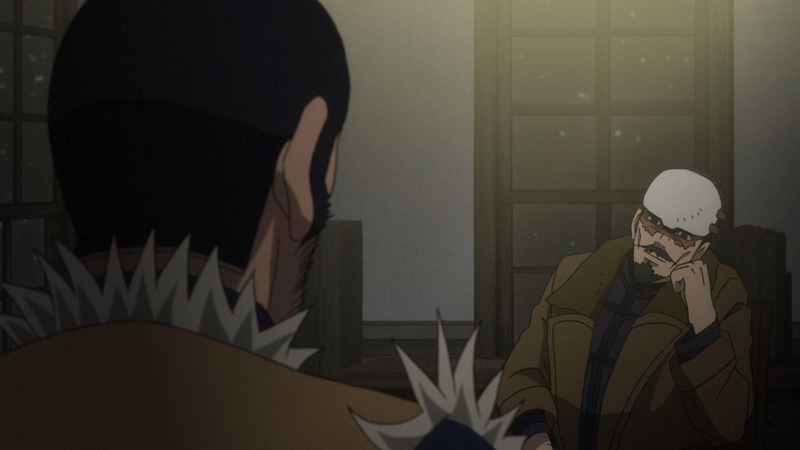 Bit by bit, Golden Kamuy has been painting a picture of a commander who is a father to his men in more ways than one. 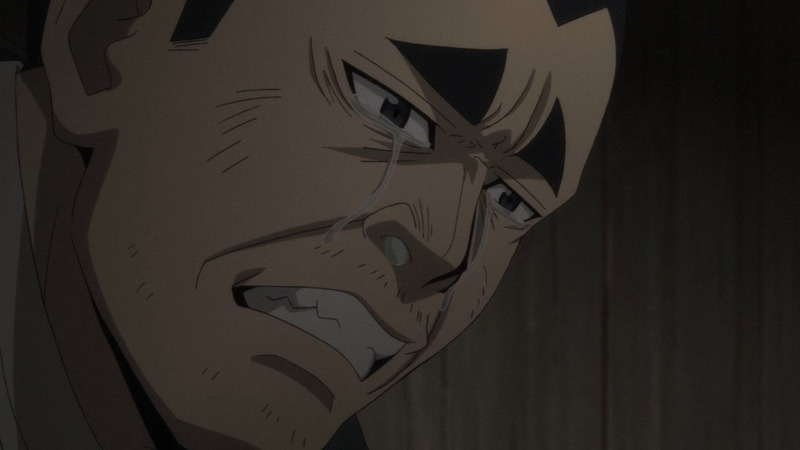 The entire Tanigaki flashback this episode was framed as Tanigaki telling his story to Tsurumi, and through that we see a more personal relationship between Tsurumi and his grunts than other military outfits. 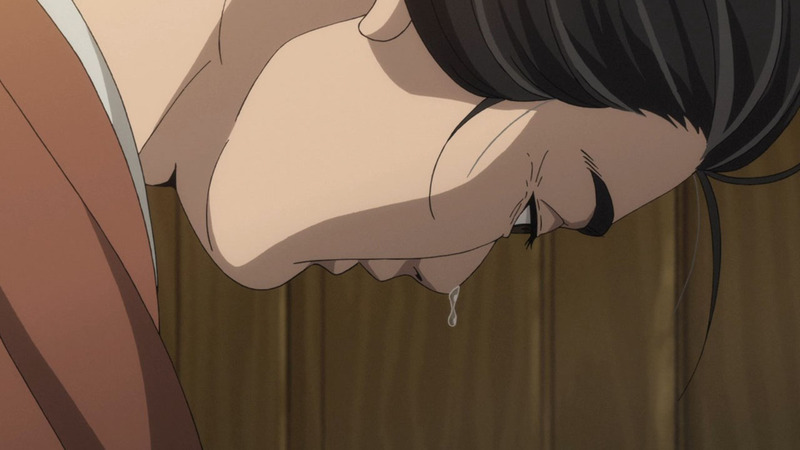 These are troubled young men, and Tsurumi lends them a willing ear and a helping hand. 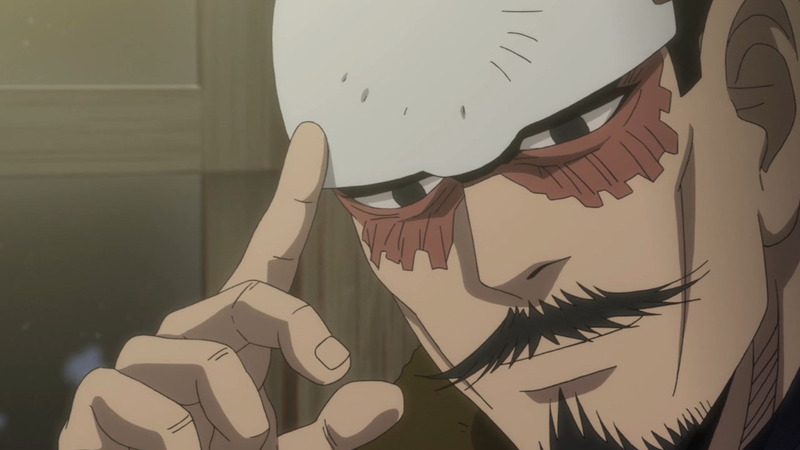 And, more importantly, he gives these lost boys a sense of purpose (even if Tsurumi is more of a Captain Hook). For soldiers who feel abandoned after war, what better coin to purchase their loyalty than a cause, any cause, for them to rally around? 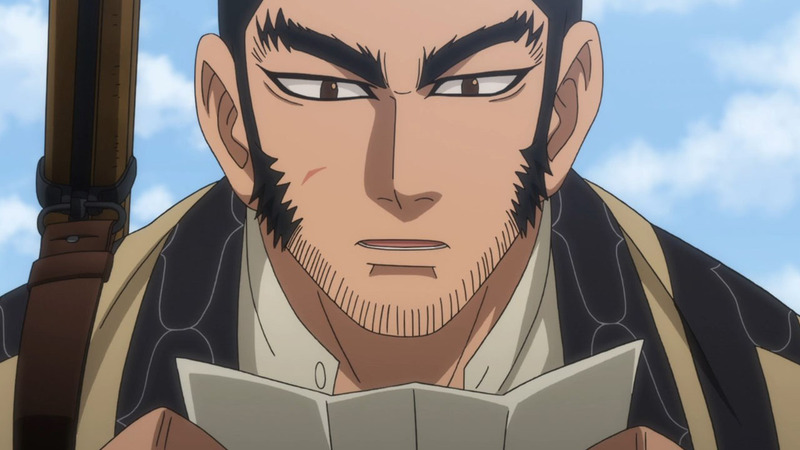 But Tanigaki has found his own purpose now, and best of luck to him. 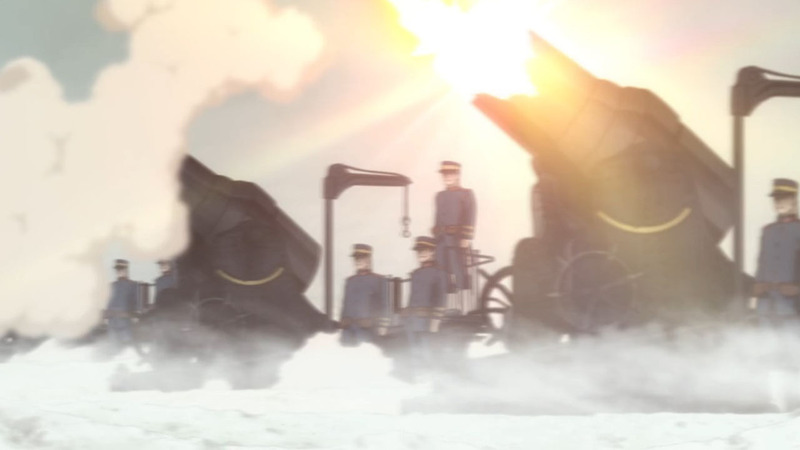 His friend found his purpose, fulfilled his purpose, then promptly died. 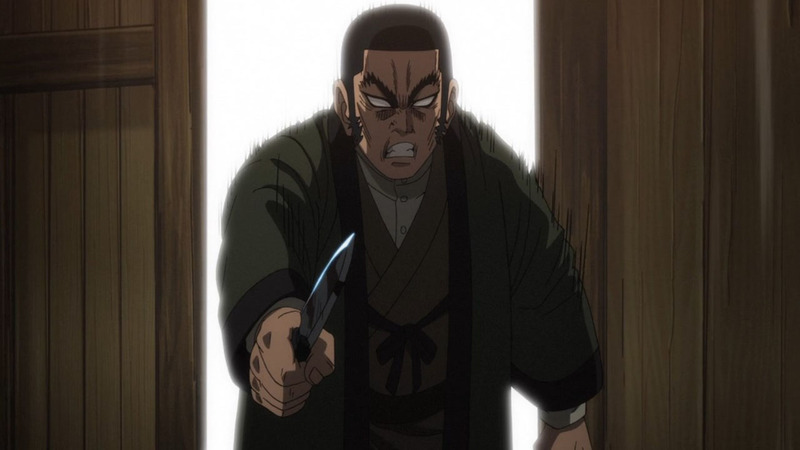 I hope Tanigaki does not meet the same fate. 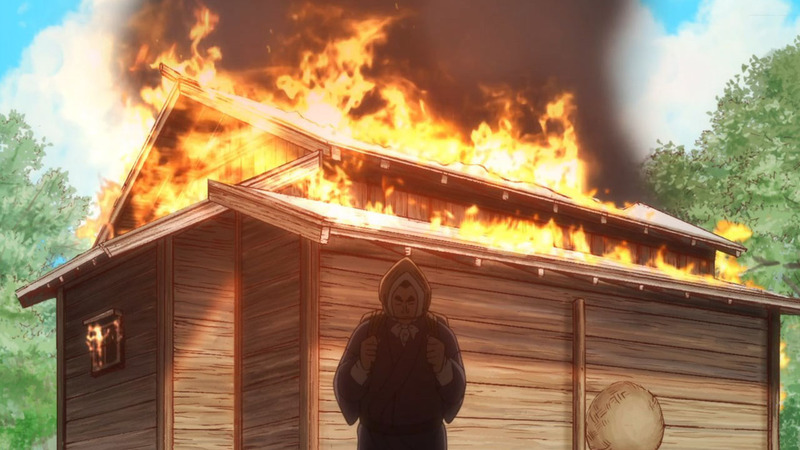 Kiroranke has been confirmed Russian, I think. 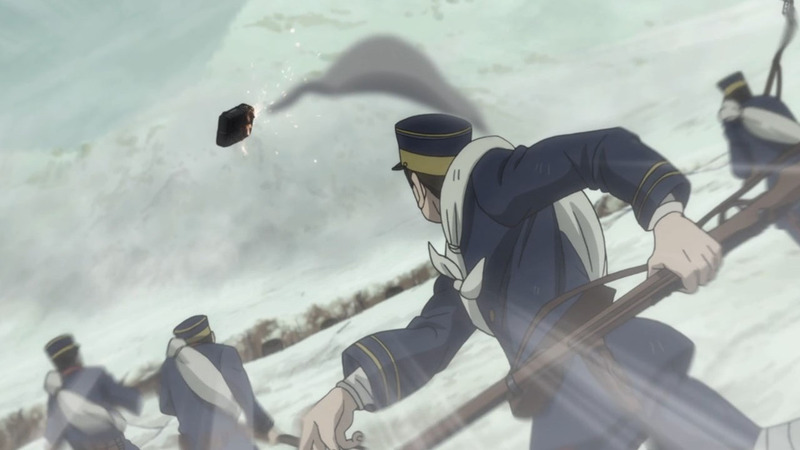 Honestly, every single person except Sugimoto probably has their own agenda. 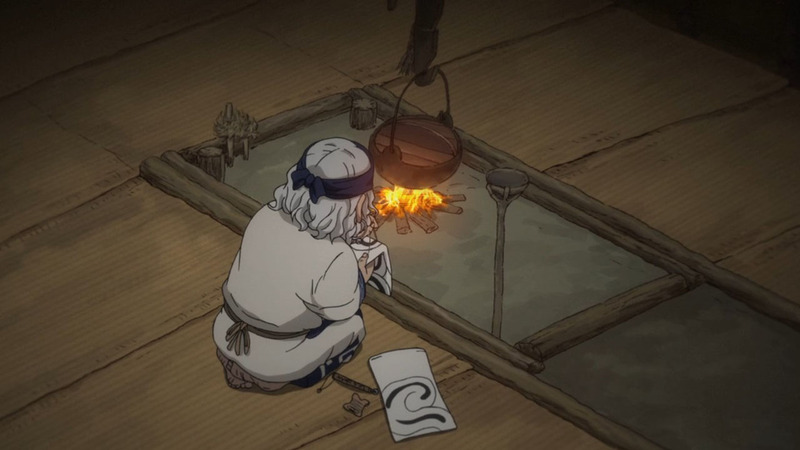 I didnt want to spoil but yeah it has been suggested that Kiroranke was Asirpa’s father collaborator in whatevcer scheme latter was up to, and now possibly has own agenda. 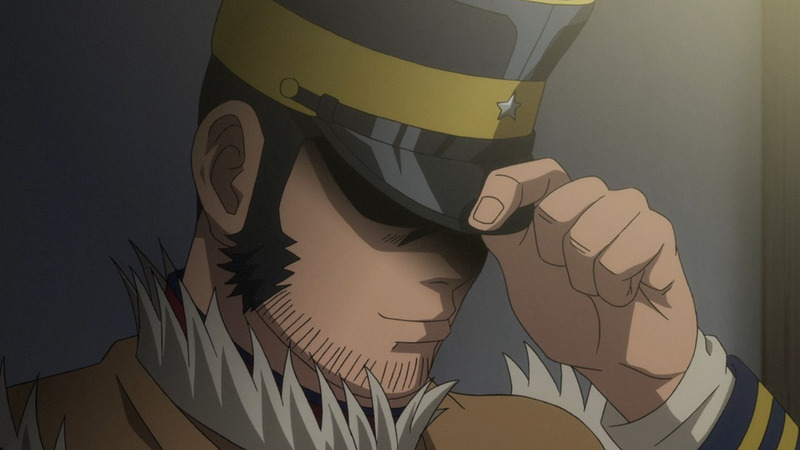 The ending scene of the story with Lt. Tsurumi also suggests Tanigaki. 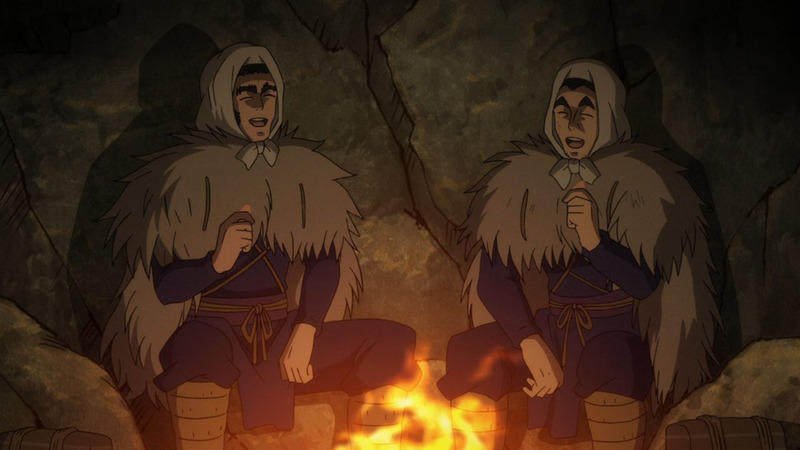 Tanigaki seems to have found his new place in life as “friend of Ainu” and ersatz father for the younbg orphan. 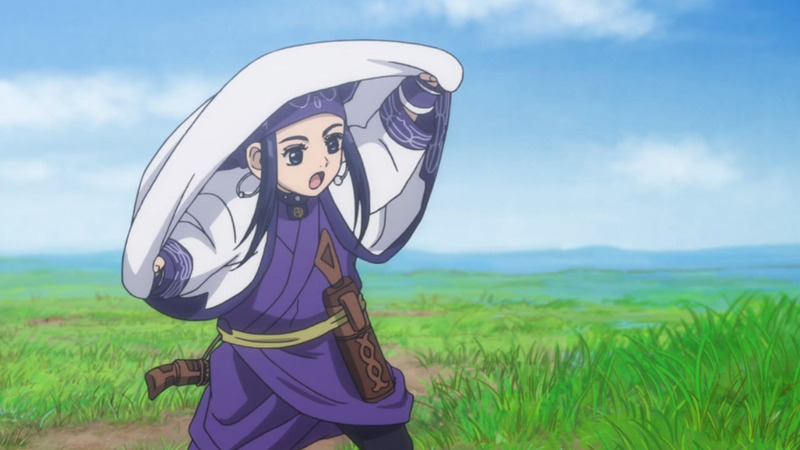 Usually I would find such flashback story as death flag but I can see a chance for him to find peace eventually… once all the crazy stuff milling around the golden treasure settles down. Also I am expecting some action from Tokyo coming down to quell brewing rebellion in the 7th. 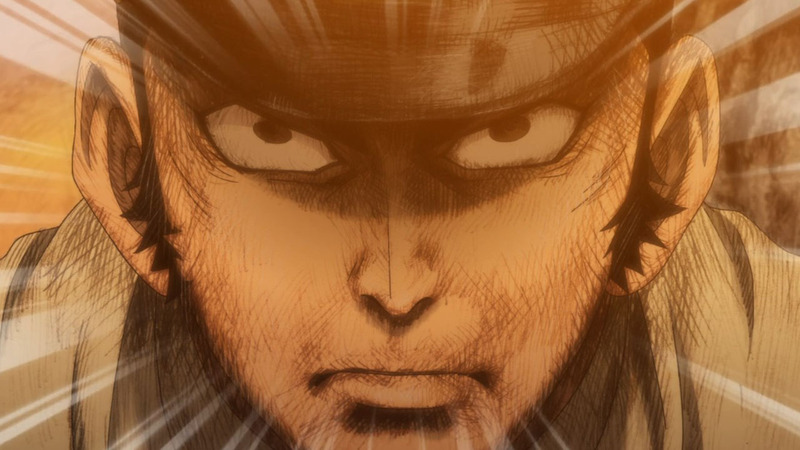 It is impossible that Tsurumi conspiracy went completely unnoticed… That would be perfect opportunity to stir the pot of troubles again, introduce new powerful characters and switch some alliances (again!). 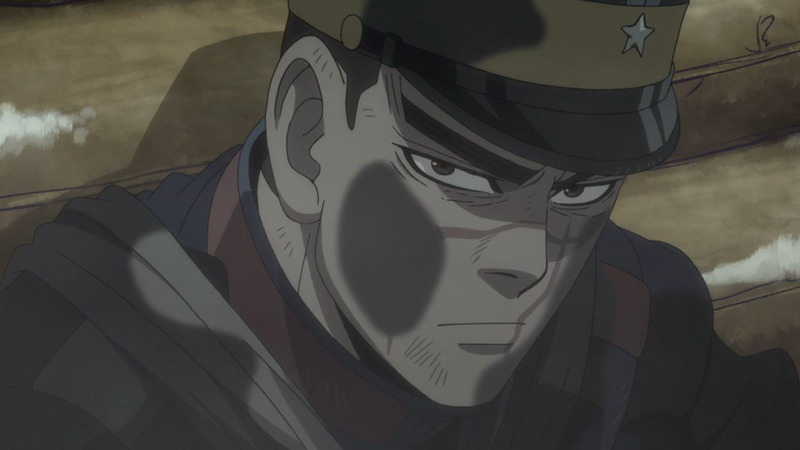 Sugimoto looking fine as usual.